I was struck by the Gospel reading today, the account of Jesus’ passion from the Gospel of Matthew. It’s a story I know so well that is hard to listen to it as if it were a true account I was hearing about for the first time. I tried to listen as if for the first time. And I didn’t really succeed, especially because I had to keep watching that my kids didn’t poke their eyes out, or mine, with a pointy palm leaf tip, but I noticed something, which obviously resonated with me because of how I’ve been feeling lately. The lines about the desolation of Jesus as he wept in the garden, “sorrowful to the point of death”, and his cry of abandonment as he hung on the cross, jumped out at me. Especially, “I feel sorrowful to the point of death”. He actually said that. Do you know that it really is possible to die of a broken heart? Thank God, I’ve never felt that kind of sorrow before, but I could imagine a bit of what it might feel like it if I let my imagination go there. And I don’t want my imagination to go there. I know enough to be grateful that God took that on for me. He never sinned, but he definitely suffered the effects of sin. How different is Jesus’s desolation in the garden and on the cross, to Peter’s. Peter, who wept “bitterly” after he denied Jesus not once, but three times. Now I totally get Peter’s distress, because it is just the kind of thing I might do – promise to die with Jesus but then be just plain unable to do the right thing when it came to the crunch, and then be utterly consumed with guilt and self-recrimination afterwards. I don’t need to imagine that. I’ve felt it. Not in such dramatic circumstances, just in little ways, but it’s very painful nonetheless, yes? When we realise we’ve sinned, and that in the sinning we’ve hurt ourselves as much or maybe even more than anyone else. I totally got Peter today. His sin and mine is not so different. When Peter denied his friendship with Jesus, when he swore that he didn’t even know the man, he was denying himself, his place in the world which, as Jesus’ right hand man, was right by Jesus’ side at least by desire if not literally. Don’t I act, often, as if I didn’t even know the man? As if I am not right by his side in this holy vocation of marriage and motherhood that he’s given me? When I yell and demand and criticise and fume and swear that I’m right and anyone who thinks differently is in the wrong? Or (more likely) when I get despondent over something? Which is not much different to Peter’s, “I don’t know who you’re talking about”. So, yeah, I get Peter. He was afraid, and had good reason to be. Me, I’m just…I don’t know…forgetful. But we’ve both denied Jesus. The difference is that I’ve got something to learn from St Peter, which is that he didn’t just stay there feeling bad for ever. St Peter went on to put that awful night behind him forever because of the resurrection. He was literally redeemed by the literal resurrected Christ, in that early morning moment by the lake. And I have to remember the resurrection because I often live, or feel, as though it never happened. As though my falling, sinning, and getting up again only to trip again is all there is to my life. This Jesus, this one who took on all the evil in the world for me, is actually, truly, really, alive, and has already redeemed me – though by a baptismal font, not a lake :), and then every time I go to confession. This is why we need to celebrate Easter year after year after year. Because we forget, truly, we forget. Life just runs on and runs us over if we let it, if we don’t stop and remember, often and each day, that Jesus is alive. And it should make a massive, practical, difference! But I’m getting ahead of myself. It’s not Easter Sunday yet. And just so you know it wasn’t all deep and meaningful around here today I wanted to show you a photo of what we did this afternoon. 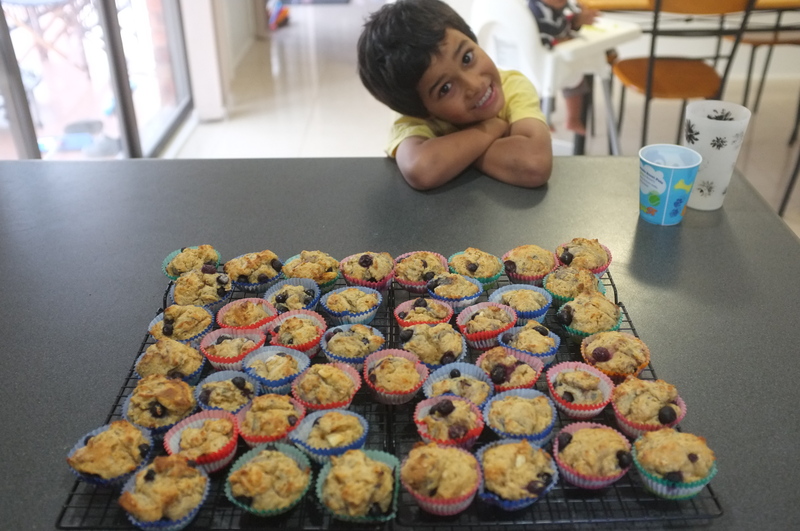 We made blueberry muffins, which are okay, but not as good as the yoghurt and berry ones I usually make. And that cute little guy didn’t even help one bit, that was the big girl who was desperate to do some baking today. 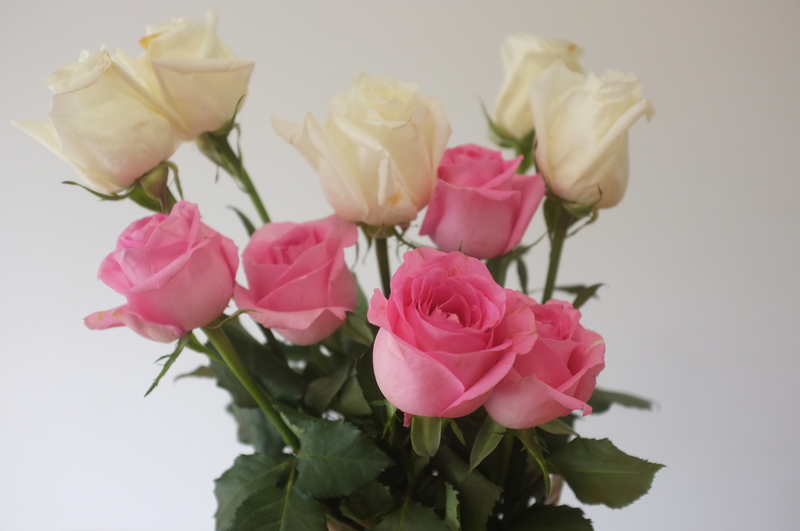 And we’re still admiring the roses we got from Peter’s mum who got given lots of flowers for her recent birthday. Tomorrow’s the first official day of the school holidays, and I have no idea what we’re going to do so I’d better go and give it some thought! Next Post For parents, it pays to be cheerful!